Adventures in the Thin Trade: Was that the last? I suspect many of you in North America are relishing the return of spring weather and having glorious runs today. It was spectacular in Florida this morning too. Nice for a little 10 miler with 25 of my best buddies; but I have this premonition that it's almost over. One of these Saturday nights I'll check the forecast and it'll say low of 75-80 tonight and high in the 90s tomorrow, with a 90% chance of afternoon thunderstorms .... from now through October. Such is life in Florida. Today I was up at 600 to feel perfect temps in the high 50s. The crowd downtown at 700 was the biggest ever. Our "guest runners" this morning were from Los Angeles. Rachel and Ed found us on the Web site and are here for a week. They were doing their last long run before a half marathon next weekend out there in the golden west. I mentioned Bex to them but her fame had not reached them yet. The run took on three parts today. I ran with the Rachel from LA, the twins, Tim and Sal the first 4 miles in blazing time. The second leg was with the musicians, Seth (who's runnning Nashville next week) and Chris. The last three miles were with Dave the Welshman. All in all I was very pleased with my heart rate and time. I never labored and everything felt smooth, despite the incredible neck crick I woke up with yesterday that was still there a little this morning. [Sherlene! Massage! Stat!] 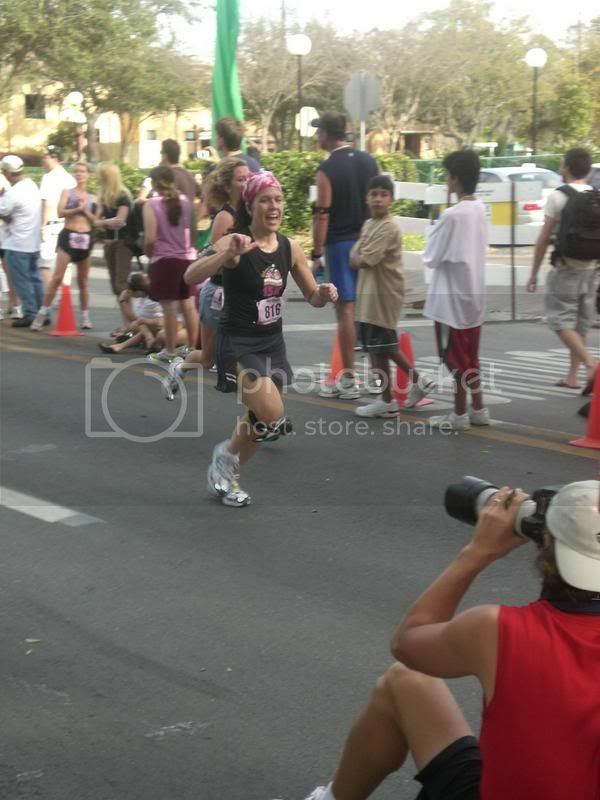 My finish time was 1:28, a competitive 8:47 pace. The run was followed by a visit to Starbuck's, a scan of the morning paper, encouraging words to Runner Susan to get out running today; and a healthy dose of yard work. I am done for the day and ready for a cold one. Carry on friends. Thorny issue. I now have a sense for how those guys in the medieval wars felt when a crossbow arrow went into your leg. It is paralyzing. In my case it was nothing more than a half inch thorn from a bush (I measured it) that went straight in and left nothing to pull on to get it out. I tried to walk to the house for some tweezers or something and I couldn't walk. It must have hit a nerve. I was amazed. Not a pleasant predicament but, then again, I had a "nurse" to ease my pains and dig it out. She used that pre-surgery orange stuff to minimize the infection. Thanks Mrs. T.
and i ran indeed, thank you david. i am, however, having some issues with my left ankle. trip to the local wine bar on friday night accompanied by walking around in my new platform shoes was not good. somehow i tripped on air? go figure! I love that you call your wife mrs. t. it's so jane austen-y. nice time on the 10! i watched a 10-mile race today, does that count??? Bring on the heat! Well, you guys down there are used to it. I'm sure it'll be no problem. What, no picture of the thorn in the leg? Glad Mrs T had some of the Orange Gunk around...that's nothing to mess with. Who knew yard work could be so dangerous! It sounds like you had a great run - and I agree the heat is coming! How in the world did a thorn get that far into your leg? You must have just backed up into it - ow! I hope it doesn't slow you down because you are smokin'!